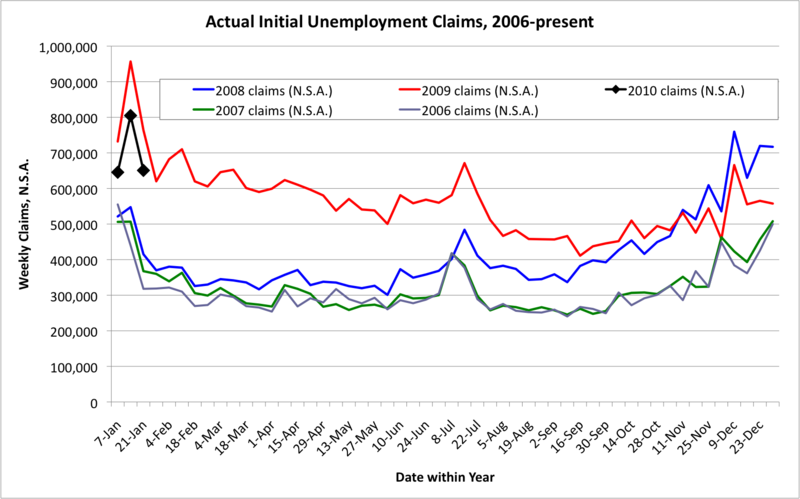 The claims data remain quite weak. Although this week’s claims were lower than last week’s, that’s just the seasonal pattern. The problem is that the three points for 2010 are only slightly better than the data from the same three weeks in 2009. The 2009 data were horrifying, and the 2010 data are too close to the 2009 data, and too far from the 2006-2008 “healthy job market”, and nowhere near indicating “recession over”. This entry was posted on Thursday, January 21st, 2010 at 14:02 and is filed under UE Claims. You can follow any responses to this entry through the RSS 2.0 feed. Both comments and pings are currently closed.